Thank you for visiting the webpage of David Galison, P.C.. This page will explain the various sections of the New York State Vehicle and Traffic Law under Article 30 Speed Restrictions. For the remainder of this page the New York State Vehicle and Traffic Law will be abbreviated as follows - NYS VTL. 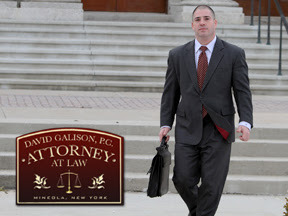 If you have questions please feel free to call DAVID GALISON, P.C., for a FREE CONSULTATION 516-242-4477. Article 30 of the NYS VTL, §1180 is titled "Speed Restrictions" and it outlines the various speeding offenses that can be committed. There are seven subsections to §1180 of the VTL; 1180(a), 1180(b), 1180(c), 1180(d), 1180(e), 1180(f) and 1180(g). If you are stopped by a police officer in Nassau, Suffolk, Queens or any other county throughout the state of New York and receive a speeding ticket, it will be charged under one of the above sections. Each of the speeding subsections (a) through (g) will be explained in detail below. As will section §1181, Driving too Slowly and section §1182, Speed Contest. The explanations will include point, fine, surcharges and possible jail sentences. Before we go into the specifics of each subsection to section §1180 of the NYS VTL there are some general rules that every motorist should know. The "Three Speeds Rule" provides that if a motorist is convicted of any three traffic citations under section 1180 within an eighteen (18) month period of time the Court must REVOKE your license pursuant to Section §510.2(iv) of the NYS VTL. Section §510.2(iv) is titled Suspension, revocation and reissuance of licenses and registrations. Under this provision the revocation of your driver's license is mandatory. Therefore, if a motorist were to receive and be convicted of three traffic tickets within any 18 month period of time under any sections of §1180 his or her license must be revoked. Even if the Judge or Hearing Examiner did not want to impose a revocation based upon a third conviction they would have absolutely no choice. To sum it up, the first rule is: Three (3) speeding ticket convictions within any eighteen (18) month period of time = mandatory revocation of your drivers license. Another rule that every motorist who operates a vehicle in New York should know is that all moving violations will result in points on your license if you are convicted for the violation alleged. Excessive points can result in the suspension or revocation of your New York State Driver's License and/or your New York State driving privileges and Driver’s Responsibility Act liability. The suspension under the excessive points rule is for motorist who are considered persistent violators. The NYS DMV will generally issue a suspension when a motorist receives more then ten points on his or her driving record within any eighteen (18) month period of time. A motorist who is notified about an upcoming suspension that is permissive has the right to request a hearing so that they may be heard under NYS VTL §510.3(a). The chart below outlines the points associated with all speed dependent violations of section §1180; ie – sections where the actual speed of the motorists affects the fine and also the points. §1180(a) - No person shall drive a vehicle at a speed greater than is reasonable and prudent under the conditions and having regard to the actual and potential hazards then existing. This subsection deals with situations where a motorist can be given a ticket even though he or she is not driving above the posted speed limit. How can a police officer issue a summons for speeding when the driver is not exceeding the limit you ask? Well, did you ever drive down the road in a snow storm and witness an SUV passing you at 40 miles per hour despite the fact that you could barely see past your windshield and your own speed was only 15 mile per hour. Under those circumstances an officer would be totally justified in issuing a speeding summons for operating a vehicle at a speed that is greater than reasonable and prudent under the conditions at the time. The fine for a violation of this section for a first offense ranges from $45.00 to $150.00. The fine for a second violation of this section within any 18 month period of time ranges from $45.00 to $300.00. The fine for a third violation of this section within any 18 month period of time ranges from $45.00 to $525.00. In addition to the above fines the State imposes surcharges upon a conviction to the above. The surcharge ranges from $80-$85 dollars. A conviction for a violation of 1180(a) Unreasonable Speed, will result in 3 points being added to your New York State Driving record. Although it is very unusual for a motorist to be sentenced to jail for a minor traffic violation it is permissible. For a first conviction the maximum jail sentence is 15 days incarceration. For a second conviction the maximum jail sentence is 30 days incarceration. For a third conviction the maximum jail sentence is 30 days incarceration. 1180(b) - Speeding in excess of 55 miles per hour. This subsection deals with speeding in excess of the statewide speed limit of 55 miles per hour. Unless a roadway has an established posted speed limit in excess of 55 miles per hour, (like certain portions of the NYS Thruway) a motorist may not exceed 55 miles per hour. This section of §1180 is taken so seriously by the New York State Department of Motor Vehicles that it is referenced under section §510(a)(4). What is section §510(a)(4) you ask? Well, if you have a CDL otherwise known as a commercial driver's license then Section §510(a)(4) is something you should know about. This section of the NYS VTL lists the infractions that are considered a SERIOUS TRAFFIC VIOLATION. Why is it important to know what a SERIOUS TRAFFIC VIOLATION is? Because, if you are convicted of two SERIOUS TRAFFIC VIOLATIONS within any three (3) year period your CDL license will be suspended for a period of sixty (60) days. And if you catch a third SERIOUS TRAFFIC VIOLATION within that same time period you can double the suspension to one hundred twenty days (120). The fine for a violation of this section depends upon how many miles over the posted speed limit you were convicted of traveling, and if you have been previously convicted of the same offense. If your speed is between 1 and 10 MPH over the limit the fine ranges from $45.00 to $150.00. If your speed is between 11 and 30 MPH over the speed limit the fine ranges from $90.00 to $300.00. And if your speed is more than 30 MPH over the speed limit the fine ranges from $180.00 to $600.00. If this is a second offense under section §1180(b) then the fine goes up. If your speed is between 1 and 10 MPH over the limit the fine ranges from $45.00 to $300.00. If your speed is between 11 and 30 MPH over the speed limit the fine ranges from $90.00 to $450.00. And if your speed is more than 30 MPH over the speed limit the fine ranges from $180.00 to $750.00. If this is a third offense under section §1180(b) then the fine goes up yet again. If your speed is between 1 and 10 MPH over the limit the fine ranges from $45.00 to $525.00. If your speed is between 11 and 30 MPH over the speed limit the fine ranges from $90.00 to $675.00. And if your speed is more then 30 MPH over the speed limit the fine ranges from $180.00 to $975.00. Exceeding the speed limit by 1 to 10 miles per hour will result in 3 points being added to your license. 11 to 20 MPH over the speed limit will result in 4 points being added to your license. 21 to 30 MPH over the speed limit will result in 6 points being added to your license. 31 to 40 MPH over the speed limit will result in 8 points being added to your license. And 41 MPH and over will result in 11 points being added to your license. Although it is very unusual for a motorist to be sentenced to jail for a minor traffic violation it is permissible. Under this section of §1180 the maximum jail sentence is determined by the speed of the vehicle and prior convictions. Speed 1 through 10 MPH over the speed limit, for a first conviction the maximum jail sentence is 0 days incarceration. For a second conviction the maximum jail sentence is 0 days incarceration. For a third conviction the maximum jail sentence is 0 days incarceration. Speed 11 through 30 MPH over the speed limit, for a first conviction the maximum jail sentence is 15 days incarceration. For a second conviction the maximum jail sentence is 30 days incarceration. For a third conviction the maximum jail sentence is 30 days incarceration. Speed over 30 MPH over the speed limit, for a first conviction the maximum jail sentence is 30 days incarceration. For a second conviction the maximum jail sentence is 30 days incarceration. For a third conviction the maximum jail sentence is 30 days incarceration. §1180(c) – Speeding Ticket in a School Zone. This section of §1180 is somewhat self-explanatory, but there is a catch. What’s the catch? The catch is that depending upon the day and time of the traffic infraction the fine doubles (See below). So if you are issued a speeding ticket in a school zone, on a date in which school is in session, between the hours of 7 AM and 6 PM, your fines will be doubled. However, the good thing is that your points are not doubled. If you possess a commercial driver’s license a conviction to this section of §1180 is considered a SERIOUS TRAFFIC VIOLATION. For an explanation of what a SERIOUS TRAFFIC VIOLATION is please read the information above under section §1180(b). The fine for a violation of this section depends upon how many miles over the posted speed limit you were convicted of traveling and whether or not it is a school day during school hours, and if you have been previously convicted of the same offense. If the ticket was issued after school hours or on a date when school is not in session then the fine schedule below applies. If your speed is between 1 and 10 MPH over the limit the fine ranges from $45.00 to $150.00. If your speed is between 11 and 30 MPH over the speed limit the fine ranges from $90 to $300.00. And if your speed is more than 30 MPH over the speed limit the fine ranges from $180.00 to $600.00. If this is a second offense under section §1180(b) then the fine goes up. If your speed is between 1 and 10 MPH over the limit the fine ranges from $45.00 to $300.00. If your speed is between 11 and 30 MPH over the speed limit the fine ranges from $90.00 to $450.00. And if your speed is more then 30 MPH over the speed limit the fine ranges from $180.00 to $750.00. If the ticket was issued during school hours on a date when school is was in session then the fine schedule below applies. If your speed is between 1 and 10 MPH over the limit the fine ranges from $90.00 to $300.00. If your speed is between 11 and 30 MPH over the speed limit the fine ranges from $180.00 to $600.00. And if your speed is more then 30 MPH over the speed limit the fine ranges from $360.00 to $1,200.00. If this is a second offense under section §1180(b) then the fine goes up. If your speed is between 1 and 10 MPH over the limit the fine ranges from $60.00 to $450.00. If your speed is between 11 and 30 MPH over the speed limit the fine ranges from $120.00 to $750.00. And if your speed is more than 30 MPH over the speed limit the fine ranges from $240.00 to $1,350.00. If this is a third offense under section §1180(b) then the fine goes up yet again. If your speed is between 1 and 10 MPH over the limit the fine ranges from $60.00 to $675.00. If your speed is between 11 and 30 MPH over the speed limit the fine ranges from $120.00 to $975.00. And if your speed is more then 30 MPH over the speed limit the fine ranges from $240.00 to $1,575.00. This section of §1180 deals with driving above the posted speed limit. This is your general running around town speeding ticket. The kind of ticket where your going to your local store on a public roadway and you see a sign that says speed limit 40 mph and you disregard it and drive 52 MPH so that you can keep up with traffic. If you possess a commercial driver’s license a conviction to this section of §1180 is considered a SERIOUS TRAFFIC VIOLATION. For an explanation of what a SERIOUS TRAFFIC VIOLATION is please read the information above under section §1180(b). If your speed is between 1 and 10 MPH over the posted speed limit the fine ranges from $45.00 to $150.00. If your speed is between 11 and 30 MPH over the speed limit the fine ranges from $90 to $300.00. And if your speed is more then 30 MPH over the speed limit the fine ranges from $180.00 to $600.00. If this is a second offense under section §1180(b) then the fine goes up. If your speed is between 1 and 10 MPH over the limit the fine ranges from $90.00 to $300.00. If your speed is between 11 and 30 MPH over the speed limit the fine ranges from $90.00 to $450.00. And if your speed is more then 30 MPH over the speed limit the fine ranges from $180.00 to $750.00. If this is a third offense under section §1180(b) then the fine goes up yet again. If your speed is between 1 and 10 MPH over the limit the fine ranges from $45.00 to $525.00. If your speed is between 11 and 30 MPH over the speed limit the fine ranges from $90.00 to $675.00. And if your speed is more than 30 MPH over the speed limit the fine ranges from $180.00 to $975.00. A conviction for a violation of 1180(e) Failure to Reduce Speed, will result in 3 points being added to your New York State Driving record. §1180(f) – Exceeding Posted Work Area Speed Limit, Highway Construction or Maintenance Work Area. This section of §1180 deals with speeding in work/construction zones. Most motorists will take notice of the temporary speed limit signs posted as they enter a construction zone. You know the signs, the ones that say “SPEEDING IN CONSTRUCTION ZONE – FINES DOUBLE”. Well, the signs are no bluff, your fines really do double if you are convicted of this type of speeding ticket. If you possess a commercial driver’s license a conviction to this section of §1180 is considered a SERIOUS TRAFFIC VIOLATION. For an explanation of what a SERIOUS TRAFFIC VIOLATION is please read the information above under section §1180(b). If your speed is between 1 and 10 MPH over the limit the fine ranges from $90.00 to $150.00. If your speed is between 11 and 30 MPH over the speed limit the fine ranges from $180.00 to $300.00. And if your speed is more than 30 MPH over the speed limit the fine ranges from $360.00 to $600.00. If this is a second offense under section §1180(f) the fine goes higher. If your speed is between 1 and 10 MPH over the limit the fine ranges from $90.00 to $300.00. If your speed is between 11 and 30 MPH over the speed limit the fine ranges from $180.00 to $450.00. And if your speed is more than 30 MPH over the speed limit the fine ranges from $360.00 to $750.00. If this is a third offense under section §1180(b) then the fine goes up yet again. If your speed is between 1 and 10 MPH over the limit the fine ranges from $90.00 to $525.00. If your speed is between 11 and 30 MPH over the speed limit the fine ranges from $180.00 to $675.00. And if your speed is more than 30 MPH over the speed limit the fine ranges from $360.00 to $975.00. Speed 11 through 30 MPH over the speed limit, for a first conviction the maximum jail sentence is 30 days incarceration. For a second conviction the maximum jail sentence is 30 days incarceration. For a third conviction the maximum jail sentence is 30 days incarceration. §1180(g) Speeding in a Vehicle that has a Gross Vehicle Weight of more then Eighteen Thousand Pounds or a Commercial Motor Vehicle with a Gross Vehicle Weight of more then Ten Thousand Pounds, With a Radar or Laser Detector. This section of §1180 is meant to discourage motorists from using law enforcement detection equipment when driving vehicles that are inherently dangerous because of their weight. If you possess a commercial driver’s license a conviction to this section of §1180 is considered a SERIOUS TRAFFIC VIOLATION. For an explanation of what a SERIOUS TRAFFIC VIOLATION is please read the information above under section §1180(b). This section of §1180 deals with the situation when the operator of a motor vehicle is driving so slowly that it is negatively affecting the use of the roadway. An example of this would be when a motorist is driving 15 MPH in a 40 MPH zone for no legitimate reason, and there is a trail of angry motorists following behind honking and pulling their hair out. The fine for a violation of this section depends upon how many times the motorist has been convicted of this violation previously. If this is the first conviction the fine range is between $0.00 and $150.00. If this is a second offense the fine range is between $0.00 and $300.00. If this is a third offense the fine range is between $0.00 and $450.00. Although it is very unusual for a motorist to be sentenced to jail for a minor traffic violation it is permissible. Under this section of §1180 the maximum jail sentence is determined by how many convictions you have for a violation of this section. If this is your first conviction the maximum jail sentence is 15 days incarceration. If this is your second conviction the maximum jail sentence is 45 days incarceration. If this is your third conviction the maximum jail sentence is 90 days incarceration. This section of §1180 deals with the situation where a motorist is driving on a public road, highway or parkway that has minimum speed limit signs posted. For example the minimum speed limit on the Meadowbrook Parkway in Nassau County, NY is 40 MPH. If you enter that parkway and drive at 35 MPH then you would be in violation of this section. This section of §1180 prohibits unauthorized races on the public roadways. If you have seen movies like the Fast and the Furious you know what street racing is. There are no points assessed against your license if you are convicted of street racing, rather your license is simply revoked. If this is the first conviction the fine range is between $300 and $525.00. If this is the second conviction the fine range is between $525 and $750.00. On a first time conviction for this offense the court can sentence up to 30 days incarceration. On a second time conviction for this offense the court can sentence up to 6 months incarceration. The information contained on this page is accurate as of 6/1/2012, laws change over time so please use the information above as a reference only, as with any legal matter I strongly suggest that you consult with an attorney to help you with any questions or problems that you may have. I have been practicing law for well over a decade. I primarily handle criminal cases (both Felony and Misdemeanor) and traffic violations. I appear in Nassau, Suffolk and Queens counties. Please feel free to call my office to setup a Free Consultation.